Extra Hitters (EH) are allowed in Nations of Greater Orlando Baseball events. Consequently, a team may choose to bat 10, 11, or more players by listing the additional players as EHs. Further, if a team chooses to bat their entire lineup, they may then utilize free defensive substitutions. 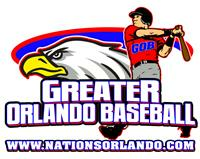 Nations of Greater Orlando allows a DH in all age divisions (except MP) as per high school rules. The 8u through 14u age groups shall not be limited by the High School Baseball Rules published by the National Federation of State High Schools (NFHS) regarding bat specifications. However, 15u and older must follow the current NFHS bat specifications, including the use of BBCOR bats.